It’s finally apple season in New York! Over the past couple of weeks, the first new crops of local apples like Macintosh, Honeycrisp, and Ginger Gold have been popping up at farmer’s markets as the piles of peaches and tomatoes have dwindled. 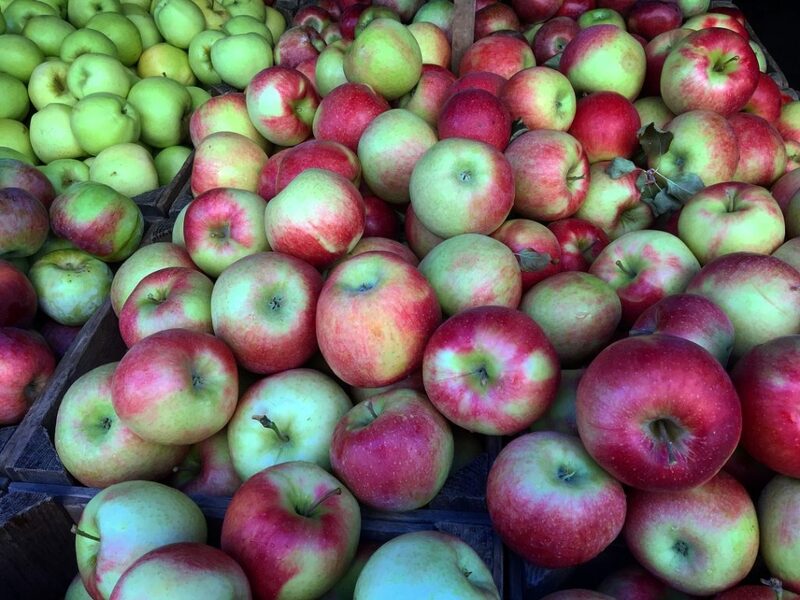 Not sure which apples to buy at the farmer’s market or grocery store? This handy diagram can point you toward a variety that perfectly matches your tastes! While fresh apples are delicious, crunchy and sweet, it’s also fun to experiment with new ways of eating and preserving America’s favorite fruit. Applesauce is a great way to mix it up! Sarah, our programs person here at Allergic to Salad, made this applesauce over the weekend with a few older and some fresh Macintosh apples, one sad peach, and few plums that needed using up. Feel free to use whatever varieties of apples you have on hand. Throw in some stone fruit (like Sarah did) or a pear if you want to get really creative! For smaller batches, which this recipe makes, the applesauce will keep for about a week in the fridge, or for a few months in the freezer. This is a great snack to include in your student’s lunchbox for a tasty, healthy treat! If you have a food mill, chinois, or other method of processing the seeds and peels out of the mix, you don’t need to peel or core your apples ahead of time. If you are just planning on mashing the cooked apples into sauce, definitely core, and peel if you prefer, your apples before quartering and adding to the pot. Add the prepped apples, cinnamon stick, and optional stone fruit to a large, heavy-bottomed pot like a dutch oven. Add a half cup or so of water (just enough so the apples won’t scorch at the bottom of the pot) and the cinnamon stick and turn the stove on to medium. Different apples will have different cooking times, so just let the fruit simmer away until all the pieces are soft. Then, remove the cinnamon stick and process the fruit through a food mill, or mash with a potato masher. Return the mashed or milled apples to the pan and add the maple syrup. Depending on how much water you used and the variety of apple, simmer the applesauce for another 10-30 minutes until it’s thick enough, and/or has reached your preferred texture for applesauce. 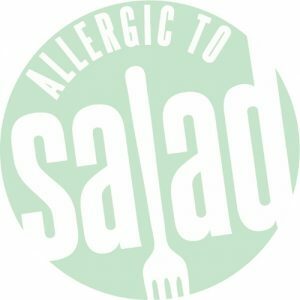 Can according to Marisa’s instructions, or ladle into freezer safe jars or containers, label with the contents and date, and put up in the freezer. Defrost in the fridge when you are ready to eat it, either as a snack, an ice cream topping, mixed in with your morning yogurt and granola, or included as a secret ingredient in a cake or quickbread. Curious about how to can your applesauce? You can find more information about canning and preserving on Marisa’s website, Food in Jars. The video below also provides some great instructions! 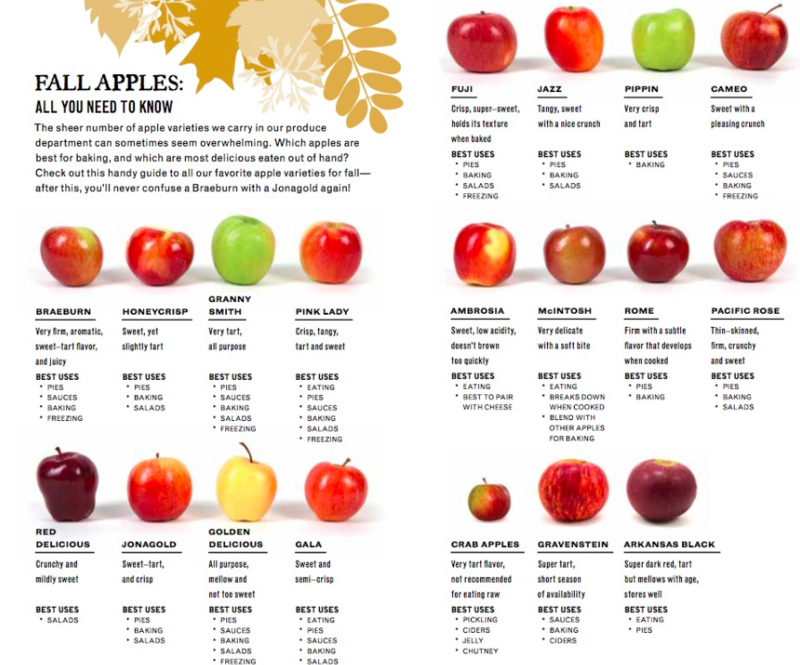 What kinds of apples are you most excited about this fall? Let us know in the comment section!